Hey guys! How odd that I’m posting so soon! First things first! I finally caved and entered the Otaku House cosplay idol competition with my Sailor Neptune costume. If you get the chance, I’d love it if you could go vote for me. Secondly! 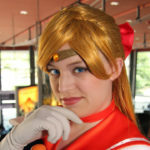 I’ve now been featured on Comics Alliance’s “Best Cosplay Ever (This Week)” for the second time. This time with my recently uploaded Batgirl photo, “Find Another Path”. Go check it out! If you’re interested in the other feature, it was for “In the Belly of the Beast”, one of my Soranik Natu photos, for their Green Lantern week. Last Wednesday (the 29th), I got to hang out with Jenn of Dangerous Ladies, Josh aka The Question, Gillykins and (of course) XandroStudio. We wore some classic DC costumes (Supergirl, Donna Troy, Nightwing and me as Batgirl) and took pictures around Toronto. The photos are EPIC and I can’t wait to get them up. If you’re interested in the previews, I’ve been posting them one by one on my fanpage.